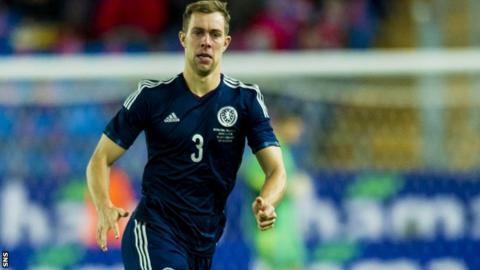 Scotland defender Steven Whittaker has played down the significance of Friday night's Euro 2016 qualifier against the Republic of Ireland. With three matches played, the Scots go into the game at Celtic Park on four points, while Ireland have seven. Whittaker admits it is a "massive" game, but insists qualification does not rest on a win against the Irish. "It's not going to stop you getting to where you want to go if you don't get the result," said Whittaker. "It's going to be right up there, with all the hype that's coming with this game. It's massive and we want a positive outcome in the end. "We're fairly evenly matched at the moment, they're ahead of us but they've probably had slightly easier fixtures." "We don't tend to concentrate too much on the opposition, the manager's got us thinking about what we're doing and how we're going to create danger for the opposition. It's a home game, so we're looking to be the more positive side. "We're fairly evenly matched at the moment, they're ahead of us but they've probably had slightly easier fixtures. It's a big game and the result is going to be massive, but we feel at home with the crowd and we're very positive going into the game." Scotland head into the Group D encounter with striker Steven Fletcher and skipper Scott Brown producing successful form at their respective clubs, Sunderland and Celtic. And Whittaker, 30, who played beside both in his time at Hibernian, believes the duo can be key contributors in the match against Martin O'Neill's Ireland. "Steven's shown no matter what club he's at he scores goals, that's why he has had the moves to stay in the Premier League," said Whittaker. "His heading ability, his finishing ability - everything that comes with him is quality. We're glad we have him up front for us. "I know Scotty well and he drives you forward as a team. "People don't give him enough credit for how good he is on the ball as well. He's a massive player for us."